The beautiful Infinity Wedding Set comes with both the engagement ring and matching diamond accented wedding band. The Infinity Engagement Ring features a unique halo and twisted shank design, accented with prong set natural recycled diamonds. The Wedding Band is the exact match to the engagement ring, contouring to follow the lines of the engagement ring for a perfect puzzle fit. Starting price is for setting only. Engagement Ring Metal Weight: 4.1gr. Band Width: 3.1mm. Side Stone Carat Weight: 0.39ctw. Wedding BandMetal Weight: 2.5gr. Band Width: 1.9mm. Side Stone Carat Weight: 0.21ctw. 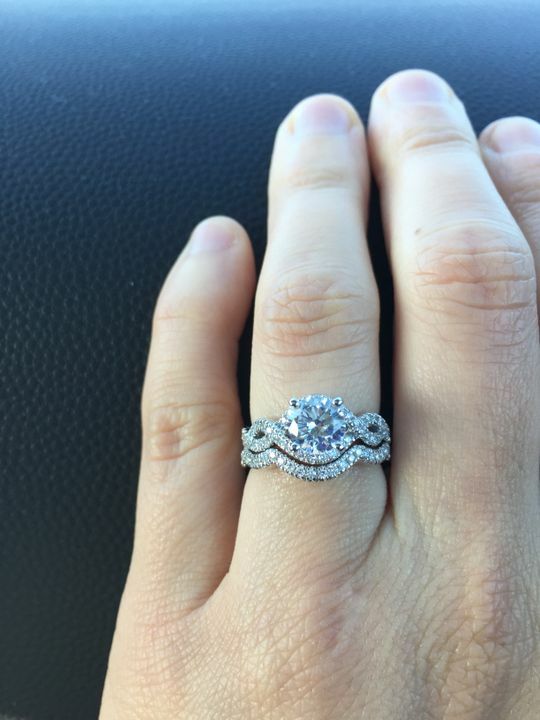 Johanna C. Reviewed by Johanna C.
This ring is absolutely perfect and stunning. Pictures cannot capture the pure beauty of this ring!